One of the things I loved about reading Marvel Comics when I was growing up was how inter-connected everything was. I loved how Spider-Man got to team up with everyone, how Dr. Doom might fight The Fantastic Four in their own book and then he might show up in the Avengers. And of course, you never knew who was going to be in The Defenders comic! In 1982, Marvel took the “reality” of their comics universe a giant step forward under the auspices of then editor Jim Shooter. He hired Mark Gruenwald to oversee an amazingly ambitious project now known as The Official Handbook of the Marvel Universe. This is how many characters it featured. I didn’t read these handbooks, I devoured them. They were amazingly detailed about the character’s first appearance, personal history, powers, team affiliations, and much more! I loved getting to know the intimate details of all these characters! The coolest thing to me was the index which listed which artist drew which character. I learned about a lot of artists that I hadn’t been exposed to and I began to follow them in titles that I hadn’t explored before. It was definitely a win win situation! One of my favorite aspects of the handbooks were the entries on teams. (Team comics are my favorite because they emphasize community. I like solo books too, but give me an ensemble cast so I can get to know as many characters as possible!) The team entries showed a head shot of each character with their name and the issue of the comic in which they officially joined that team. My favorite team entry was , of course, the X-Men but not because they were my favorite comic. I loved this entry because Alan Davis drew it. 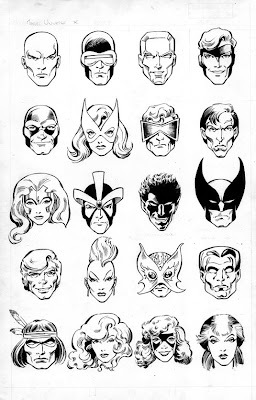 Here’s Alan’s renditions of the official X-Men team roster from the beginning: Professor X, Cyclops, Iceman, Angel, Marvel Girl, the Mimic, Changeling, Polaris, Havok, Nightcrawler, Wolverine, Banshee, Storm, Sunfire, Colossus, Thunderbird, Phoenix, Shadowcat & Rogue. Aren’t they beautiful? Doesn’t he capture each character’s emotional core? Page two shows us Rachel Summers (later Rachel Grey) aka Phoenix II, Magneto, Psylocke (before she went all ninja bimbo), Longshot & Dazzler. 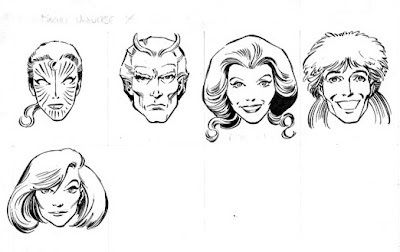 So many characters have joined since this roster was drawn that I would love to see it updated (by Alan Davis, natch! ), especially in lieu of how many spin offs there have been, are now and will be. I think it would be a helpful addition to the X-Men mythos for old and new readers alike. I mean, we can’t leave this at Dazzler, can we? The Marvel handbooks have been revived a few times and they come out nowadays mostly as a series of one shots focused on certain families of titles (like Wolverine 2004 or Avengers 2004). They are kinda like infomercials designed to help out new readers pick up the newest crossover or event. The recently published Marvel Atlas is more in line with the spirit of the original handbooks.